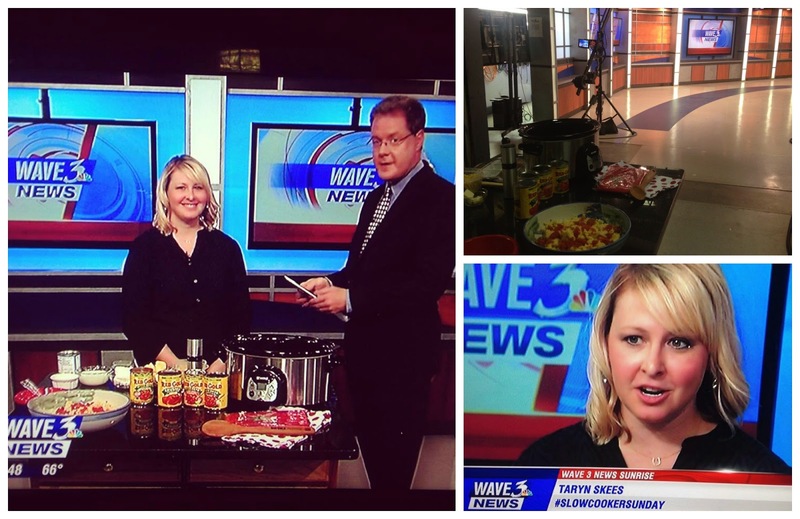 So the other day someone asked me to represent their brand by using their products to make a crockpot recipe and then share the recipe and review on my blog and then also on my local news stations Sunday morning show. I had to laugh because, well, if you know me, you know that would be...ridiculous. I hate to cook. I do it, but do I enjoy it? Not usually. I get various requests like these from time to time and I tend to only choose ones that make sense and would be valuable to my particular audience. Before I committed, I double checked that they had indeed sent their request to the right person. They assured me they had visited More Skees Please and thought that as a busy mom of 4 kids, I would be a good fit for using Red Gold products to make quick and easy crock-pot meals. Ahhh - yes, that does make sense. I do use my crock-pot quite a bit. Especially this time of year. Since I no longer felt like a fraud...I said yes! When I received my package, I was pleased (and surprised) with the variety they included. I don't think I had ever noticed that you could buy Petite Diced Tomatoes flavored with Lime Juice & Cilantro or Garlic & Olive Oil. Yum! And while the recipe I chose didn't call for either one of those, I'm definitely going to find a way to try those out in one of my old standby's (tacos and/or baked chicken). So, on to the recipe. I chose to make their Spicy Slow Cooker Macaroni and Cheese (although since I was having my kids try it, I omitted the "spice" of the diced tomatoes with green chilies and substituted the regular diced tomatoes instead). Have you ever had Outback's mac and cheese? You guys, this was better. Nevermind the fact that it probably has a zillion calories, this is comfort food at its finest...and with a twist. Adding the tomatoes gave it great flavor and Aiden loved it! Ethan on the other hand? Well, lets just focus on the the positive: the Red Gold diced tomatoes are large enough to pick out if you have a picky eater like I do! 1. Place the uncooked pasta in the bottom of a 3.5-qt. crock pot that has been sprayed with cooking spray. Add the remaining ingredients, except RED GOLD PETITE DICED TOMATOES with GREEN CHILIES, to the slow cooker and stir until well combined. Cook on LOW for 4 hours. 2. Just before serving add RED GOLD PETITE DICED TOMATOES with GREEN CHILIES; stir to combine. I am going to throw out there that while it didn't end up looking that great, it tasted phenomenal! Now, the television segment. I had a blast but it was quite a bit of work. Not to mention that it was for their 6:00 AM show, so I had to be up by 4:30 to shower and get to the studio on time. Not exactly what a sleep-deprived mom of an 8-month old who JUST STARTED SLEEPING THROUGH THE NIGHT (ugh) wants to do. But...if you know me, you also know I won't pass up an opportunity to be on TV :) And because I truly believed in the quality of the recipe and products, again, I felt it was a good fit. Remember how I said it didn't end up looking that great? Well, reheated leftovers look even worse. In fact, one of the show's producers came in, looked at my "presentation" dish and said "What'd you make? Scrambled eggs?" I laughed nervously and said, well, no, actually it is mac n cheese. Tasting is believing! He complimented my setup for the segment and also said: "Hey, you managed to make mac n cheese look nothing like mac n cheese. Congratulations!" Well, what can I say. This is in typical Taryn fashion when it comes to all things cooking. We all had a good laugh which got out any lingering nerves before the live segment began. Overall I think it went really well. I was able to talk about the fact that Red Gold products are made from tomatoes grown right here in the midwest in the Ohio, Indiana and Michigan regions. If you want to learn more about how the company seeks to accomplish their mission of "producing the freshest, best-tasting products in the world", visit their website at: http://redgold.com. Also, Red Gold is giving away two slow cookers a day on its Facebook page. The promotion runs until October 8th! Just go to https://www.facebook.com/RedGold to enter. I will randomly choose one person to win on Wednesday, October 8th. Black bean and pumpkin chilli! I'm addicted to pumpkin!